Yes Folks, The Race is on. Now that Amnesty is closing in, so are the other 20 million Illegal Immigrants. The invasion will end,,,,,,,,,,,,,once they`re all here. 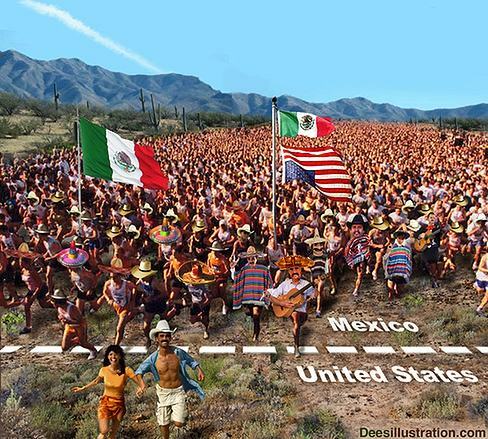 And they are all headed for the nearest Mexican consulate to find out what benfits and freebies they are 'entitled' to. Also, the picture is not accurate. There are not hordes of pregnant women leading the charge. There are not hordes of pregnant women leading the charge. Kennedy must have sent some buses down to give them, "another free ride". Ha..ha.ha. Viva cinco de Mayo and Telemundo!!!! If you mean rUin..........yeah, you're probably spot on. I guess you pretty much answered our questions in here that we asked this week about where you stand on illegal immigration and your reconquista advocacy with this post, didn't you?